"Most Thorough Leather Furniture Cleaning Santa Barbara!" It is very important that you entrust your leather upholstery to a knowledgeable, conscientious leather cleaning expert. Different leather pieces require different cleaning methods and different cleaning products. If treated improperly, leather will lose years of its life or possibly ruin the entire piece. We at Healthy Home Plus know our clients value their leather investments and want only the best quality cleaning that keeps the long term condition of their leather furniture in mind. Beware of the improper leather cleaning methods out there that use cheap harsh chemicals that strip leather of its essential natural oil. Such abuse causes leather to dry out and harden. The drier leather becomes, the more brittle its surface and the more cracks will appear. Improper cleanings can literally be worse for your leather upholstered furniture than not cleaning them at all. Healthy Home Plus use a specialized leather cleaning solution as our base and then customize it depending on your specific leathers needs. We also use specialized non-damaging cleaning brushes that are gentle and yet very effective at reaching and removing deeply imbedded soil, dust, body oils and airborne pollutants from your leather upholstery nooks and crannies. We utilize three different leather cleaning methods because there is no one-size-fits-all leather cleaning method. Most leather can be cleaned with moisture, but other require dry cleaning. Still other types of leather can only take gentle hand cleaning. If a uneducated cleaning company uses the wrong method or cleaning agents on your leather, serious damage can result. Healthy Home Plus has the most experienced technicians that are knowledgeable about the many different kinds of leather and how to care for them. By knowing precisely the characteristics of your specific leather, they will expertly select the method that will yield you the best cleaning results while protecting the leathers integrity. We have restored countless leather pieces that were even 15+ years old so well that our clients say that they look the same as when they brought them home from the showroom. Even six month old leather pieces can show huge improvement after you get the most thorough leather cleaning ever seen. Call 682-9483 Right Now To Preserve The Origional Color and Texture of Your Leather! In addition to our "Most Thorough" leather cleaning, we include our rejuvenating leather conditioning treatment as part of our service to you. Leather conditioning should always go hand in hand with profesional leather cleaning. Conditioning replaces shine on finished leather and helps impede future soiling, prevent fading and cracking from dehydration. It is very important to condition leather at least once every year; more often if it sees heavy use or is in direct sun light as these accelerate the leather dehydration process. Conditioning helps repair slight fading and sun damage by darkening leathers color. Our rejuvenating leather conditioning treatment is essential for the life, looks and durability of your newly cleaned upholstered leather furniture.
. Aniline (A) – Also known as Natural, Pure, Naked and Unprotected leather.
. Protected (P) – Also known as Semi-Aniline, Pigmented and Painted leather.
. Nubuck (N) – Also known as Chaps, Bomber or Suede. 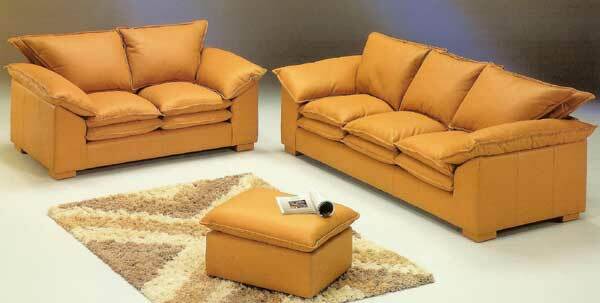 Your Leather Furniture Deserves a Thorough Cleaning and Conditioning! We at Healthy Home Plus have over three decades of experience cleaning and conditioning leather furniture in Santa Barbara. We have learned priceless knowledge about the proper way to treat all types of leather and the way certain stains react to different types of leather. Rest assured, we are not a fly by night operation. We not only aim to please you but we aim to completely impress you so that you invite us back in the future and refer us to your family, friends and neighbors. If we are at your home performing one of our many other cleaning services, be sure to ask one our technicians for a free no-obligation leather cleaning demonstration. By spot cleaning a small portion of your leather furniture we can show you the magnificent results! How Long Will You Go Without Getting A Thorough Leather Furniture Cleaning? or Request an Online Instant Leather Cleaning Quote Right Now!